The Employee class in the listing has no main method, so there’s no starting point for executing code. To fix this deficiency, the programmer writes a separate program with a main method and uses that program to create Employee instances. This code listing shows a class with a main method — one that puts the code to the test. To run the code, your hard drive must contain a file named EmployeeInfo.txt. The DoPayroll class in the second listing has two methods. One of the methods, main, calls the other method, payOneEmployee, three times. Each time around, the payOneEmployee method gets stuff from the EmployeeInfo.txt file and feeds this stuff to the Employee class’s methods. 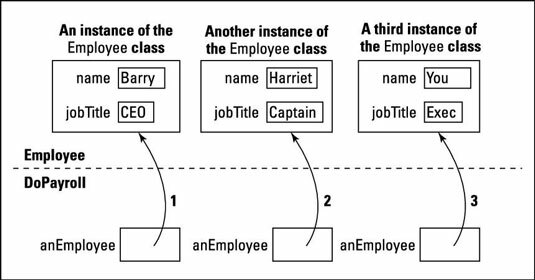 The first time that payOneEmployee is called, the statement anEmployee = new Employee() makes anEmployee refer to a new object. The second time that payOneEmployee is called, the computer executes the same statement again. This second execution creates a new incarnation of the anEmployee variable that refers to a brand-new object. The third time around, all the same stuff happens again. A new anEmployee variable ends up referring to a third object. The whole story is pictured here. Three calls to the payOneEmployee method.